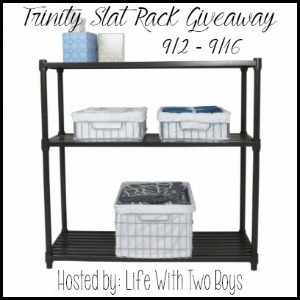 Welcome to the Trinity Slat Shelving Rack Giveaway hosted by Life With Two Boys. Trinity offers quality storage and organizational products that make your life more organized, more accessible, and more convenient. With a variety of storage products for your home, your garage, and even your outdoors, Trinity is sure to have something for everyone’s organizational needs. Thanks to Trinity, one lucky reader is going to win a 3-Tier Slat Shelving Rack in dark bronze. This shelving rack features 3 consumer-grade 36” x 14” shelves that each hold up to 350 lbs. Use it in your hallway and add a nice touch with wicker baskets, in your pantry to hold all of your small appliances, or even in your garage for extra storage. Giveaway ends at 11:59pm EST on September 16, 2014. I would love to have the TRINITY EcoStorage™ 48″ NSF Stainless Steel Table. I would love one of the deck boxes for all the kids toys outside. I would also love to own the TRINITY EcoStorage™ 5-Tier NSF 48″ x 18″ x 72″ Wire Shelving Rack w/Wheels – Chrome. We used them at UML Inn and Conference Center. I fell in love with the fact of how easily they still move when fully loaded with supplies. I mean they store heavy food bins on them. These are really quality shelving, and they clean up wonderfully. There they just hose them down with disinfectant soap, then water, and wipe them down. How easy is that. LOVE them! family. This would organize the chaos and mess perfectly! I would like the EcoStorage Baker’s Rake for my new apartment. I’m moving in 3 weeks and it’d be perfect! I would love to own the TRINITY EcoStorage 5 Tier Shelving rack. I’d also like to own their barstools. It would add a nice element to my kitchen area. I would love to own the TRINITY EcoStorage™ Closet Organizer. We own an older house and the closet are very small. I would love to have this organizer because I could put the organizer in my basement and store my non-seasonal cloths in it. I like that this organizer has a cover so that my cloths wouldn’t get dusty either.